A couple of weeks ago I paid a visit to the newly renovated National Museum of Scotland in Edinburgh. Whilst the new galleries are fantastic (and it’s always great to see dinosaur skeletons) my main focus was on finding the new home of a red cylinder with more than a passing resemblance to a British post box. This unassuming object is SCUBA – the Sub-mm Common User Bolometer Array – a ground-breaking astronomical instrument which was mounted on the back (or, more accurately, the side) of the James Clerk Maxwell Telescope in Hawaii from 1997 until 2005. It’s job was to trace star formation throughout the Universe by detecting the cold dust surrounding stars, and within galaxies, that’s invisible to optical telescopes. This dust absorbs starlight, heats up (slightly) and re-radiates this stolen energy at longer wavelengths such as the submillimetre (the far-infrared Herschel Space Observatory is also great for this). SCUBA combined sensitivity with a relatively large field of view, compared to the instruments that proceeded it. This meant that it opened up this hitherto little explored wavelength range, and found unexpected things. One of its most important discoveries were the SCUBA galaxies – extremely dusty, extremely distant, objects undergoing massive amounts of star formation. The image below shows the famous Hubble Deep Field in both optical and submillimetre light. Most of the galaxies seen by Hubble are missing in the SCUBA image, but the ones that are visible are producing around a third of the total optical light present. 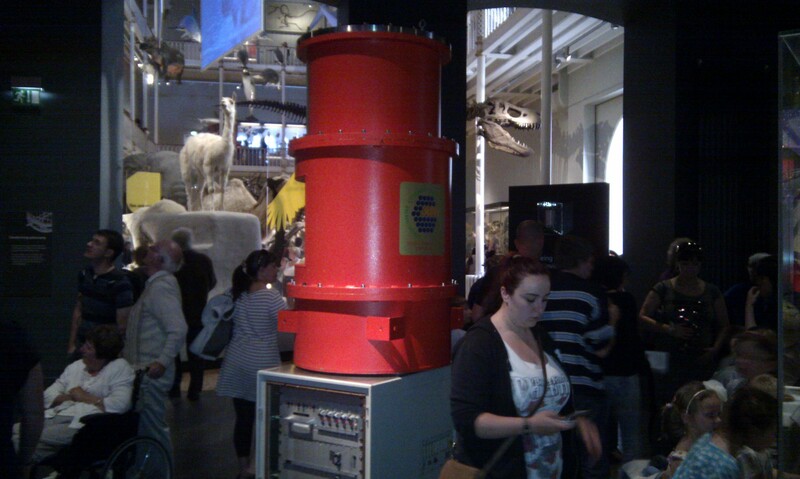 After its retirement SCUBA returned home to the Astronomy Technology Centre at the Royal Observatory in Edinburgh, where it was built, before moving to its final resting place in the museum. Its successor, the imaginatively titled SCUBA-2, is just entering routine operations in Hawaii. It’s a shame that everyone in the photo above seems determined to ignore it – if you live nearby maybe you could visit it and give it some of the attention it richly deserves. Hello again from the top of Mauna Kea. It’s night 5 of my 7 night run using the James Clerk Maxwell Telescope (JCMT) and it’s all going pretty smoothly so far. The main effect of the altitude on me so far is sneezing, which I am doing with annoying frequency. If you want to find out more about what I’m doing up here check out my first mountain post here. This is the JCMT, taken with the camera on my phone (ensuring it was in airplane-safe mode so it didn’t interfere with any observations). Annoyingly for you, I forgot the cable to transfer photos from my digital camera to my laptop so you’re all stuck with the slighly more rubbish ones. Yesterday the telescope operator took me up on the roof to look at the view, and we walked round the overhanging walkway. The telescope control room is a pretty relaxed place. Modern telescopes like the JCMT are so complex that astronomers like me aren’t allowed to move them ourselves. All we have to do is pick the next thing to look at and then the Telescope Operator does all the hard work. However, since each observation takes up to an hour to complete there’s lots of time for doing other things like blogging or watching Andy Murray in the Australian Open Final. 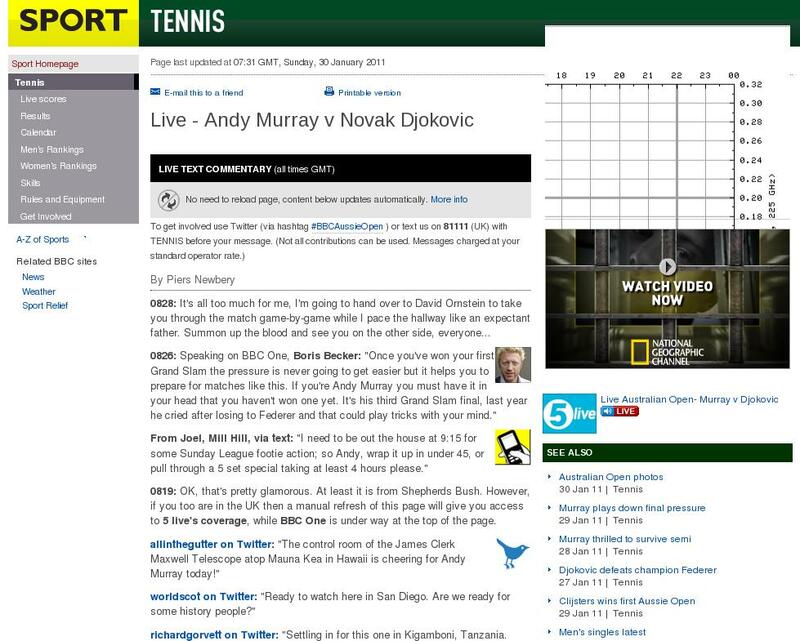 We even got a mention on the BBC! I’m aiming to do one more mountain post on my last night (tiredness permitting), in which I’ll try and explain more about the science I’m trying to do up here. Well, that or I’ll just post some more photos! It’s just past 4am Hawaiian time (about 2pm GMT) on my first night of observing and I need something to help me stay awake so I’m writing this post. 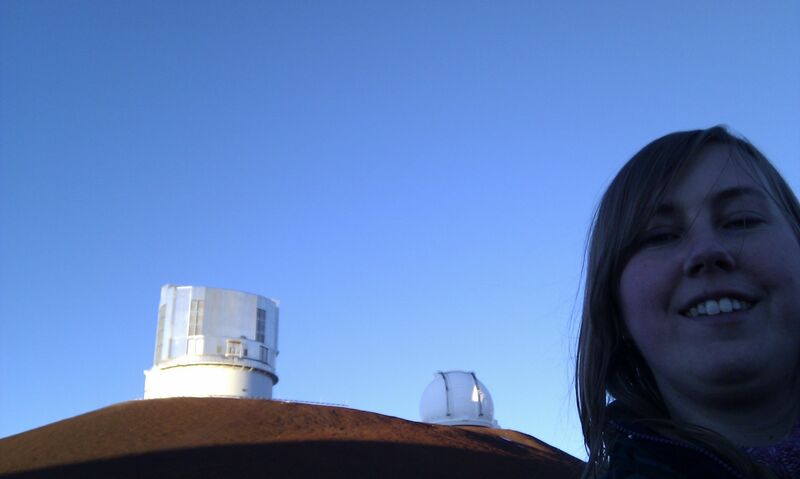 I’m at the James Clerk Maxwell Telescope (JMCT) on Mauna Kea, 13,796 ft above sea level. Becuase it’s so high, being up here is pretty difficult – you can really feel the lack of oxygen and you have to be constantly on the alert for the symptoms of altitude sickness. Mainly I’m trying not to move around too much! The control room of the JCMT, where I sit, rotates with the telescope so every now and then it starts rocking. It’s a bit disconcerting but I think I’m getting used to it. The biggest problem is that the toilet moves as it’s on the non-moving floor downstairs, and it can take a while to find it! I’m here to map the clouds of molecular hydrogen in 50 nearby galaxies using the HARP-B instrument. However, this gas is really difficult to detect directly so what I’m actually measuring is carbon monoxide, which tends to hang out in the same clouds. People are only allowed to spend 14 hours out of every 24 up here at the summit, so we all stay at a dormitory complex called Hale Pohaku down at 9,300 ft. It takes about 40 minutes to drive up to the summit, mainly because the first section of the road isn’t paved. We didn’t come up to the telescope until 7:30pm tonight so it was already dark when we set off, meaning we had a beautiful view of the night sky all the way. 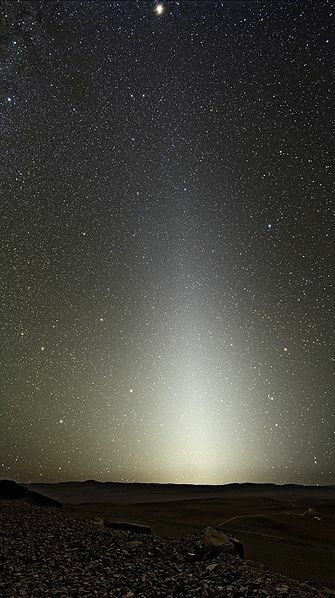 I was also lucky enough to see the zodiacal light, which comes from sunlight reflecting off dust in the Solar System. You need a very dark site, with no moon or light pollution to get a glimpse of it because it’s so faint. I didn’t have the right camera to get a photo of it myself but the picture on the left, taken at an observatory in Chile, shows it well. 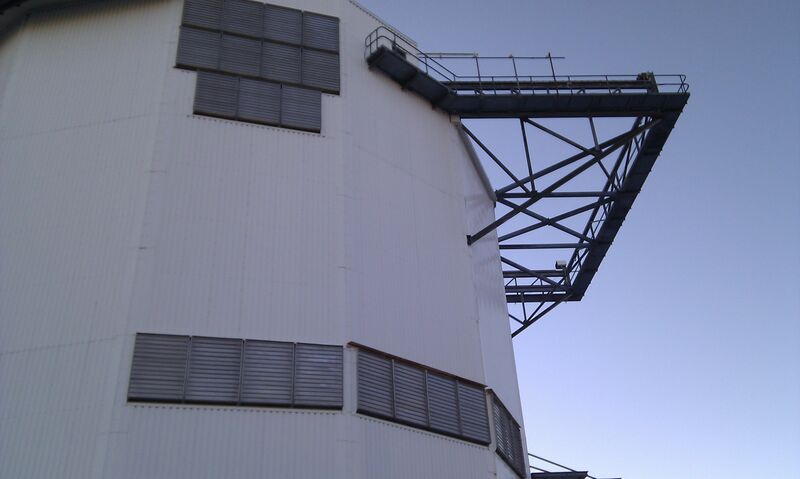 When we reached the summit, most of the other telescopes up here had already opened up and started working. This meant that I got to see the Keck artificial guide star laser, that I’ve blogged about before, shooting up into the sky. It’s nearly 5:30am now so I’d better wrap this up before I get too tired to write straight. I’ll be up here for another 2.5 hours tonight, and then for the next 6 nights after that, so this probably isn’t the last post from the mountain. If you’ve got any questions about what’s it’s like up here please leave them in the comments and I’ll try to answer them in as coherent a way as possible!